Welcome to Project 333 Style Stories, a brand new series featuring real people dressing with less. Your stories are so important and will inspire people to try Project 333 and discover the benefits of dressing with less. Send me your style story for consideration with 3 images of you and your 33 and answers to the questions below. I live in a small town in western Massachusetts, where it can be 0° in the winter and over 100° in summer. I’m self-employed as a Web designer, so a typical workday means taking my laptop to the coffee shop for the morning and working from home in the afternoon. On weekends, I read, cook, garden, and take walks with my husband. Theoretically, I could spend my whole life in yoga pants – but I don’t feel professional or put-together if I do. 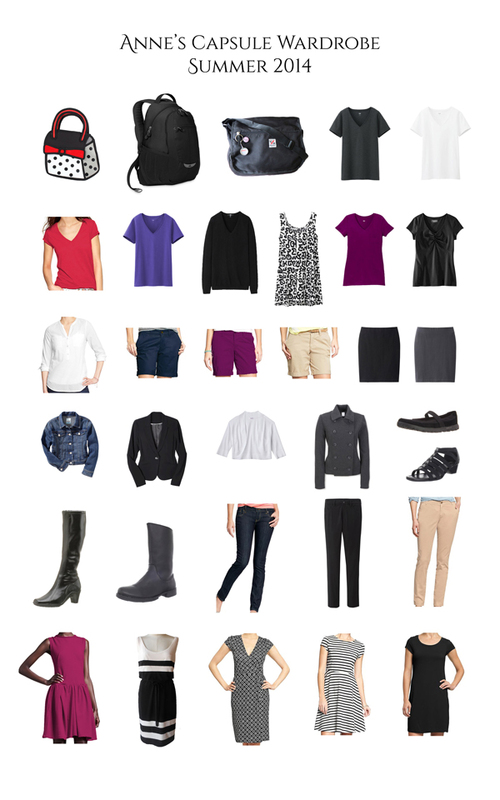 When I first heard of the project, I thought, “I’d have to buy more clothes to get up to 33 items!” I wore a ‘uniform’ of khaki pants or shorts with long or short-sleeved t-shirts: functional but boring. I felt guilty about spending *any* money on clothes. At one point a few years back, I owned only one pair of pants, which I doggedly wore every day. A few months ago, my family reorganized our budget, and now my husband, 13-year-old daughter and I each receive a monthly allowance toward clothes and other personal expenses. I decided to invest in a comfortable, mix-and-match wardrobe that would make me feel polished. Nothing in my collection is expensive; one pair of boots cost $50, but nearly everything else was between $4 and $30. I now have appropriate, flattering clothes for any occasion, and no guilt whatsoever about the money I spent. Best of all, everything is carefully curated – there’s nothing extraneous, yet I don’t feel deprived. I decided not to include jewelry or accessories in my 33, because for me, they take up minimal space and expense. Every day, I wear my wedding rings and one other piece of personally meaningful jewelry, plus a pair of small earrings and the occasional scarf. Like most people, I didn’t include workout clothes, pajamas, underclothes, or socks in my count. I once read that most people wear 20% of our clothes, 80% of the time. That seemed wasteful to me, and it feels great to just eliminate the clutter and keep only the best. I’ve also had SO many compliments! My husband compliments me almost every day; and from friends and strangers, I’ve heard things like “You look like you just stepped out of New York City” and “You are my outfit icon.” This is completely new to me, and it’s a major boost. I’m so happy to hear it – you’ve made my day! I hope you’ll get as much out of the project as I have. That’s a really nice capsule wardrobe. Black and white, with a few splashes of colour. And it looks like it will all mix and match! Fabulous! This is a delightful and refreshingly different story of P333. I love knowing there are people in the USA who need to buy MORE clothing, rather than less! LOL! I found Anne’s approach to her wardrobe (and that of her other family members’ wardrobes) to be transparent, thoughtful, and full of integrity. I think she has a real sense of delight in the items she purchased and now wears — that is my goal, too. Thanks, Anne, for sharing your story! I’m so glad to read about someone else who has to buy more stuff to get to 33 items. I’ve been hitting the charity shops recently to get enough clothes to be able to wear outfits other than jeans + maternity top that I bought when pregnant with my youngest child who is nearly 5 + cardigan. I love your capsule wardrobe, your colour scheme is great! You ALWAYS look so professional and put together, I love the clean lines and proportions of your outfits. Now I feel as though I should put a little bit of effort into it too…. Great color scheme! I love your jacket choices, very versatile. I love your wardrobe! you did a fabulous job picking your items. I’m going to do 333 Project for the first time in October and we’ll see how I do, I need professional, church and weekend clothes, I hope mine looks as good as yours.